When it comes to designing United States coinage, the Mint has traditionally employed designers responsible for creating the designs. In some situations, such as the Jefferson Nickel and many of the different Statehood Quarters, public competitions were held, resulting in the opportunity for people outside of the Mint to create lasting coinage designs. 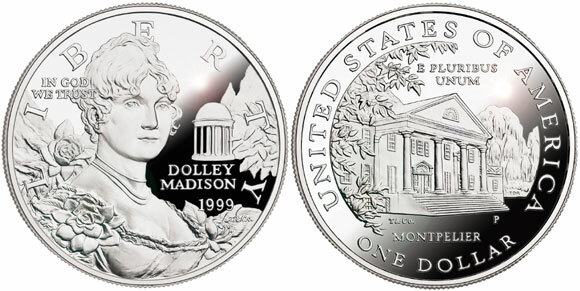 And then there is the 1999 Dolley Madison commemorative silver dollar. Its design was neither created by a mint employee nor anyone individual outside of the United States Mint, but is credited to a for-profit company, Tiffany & Co. This is a unique situation in United States coinage that has a history of multiple centuries and something that requires a little bit of explanation. The idea of the Dolley Madison commemorative originates some time prior to the 150th anniversary of her death in 1849. 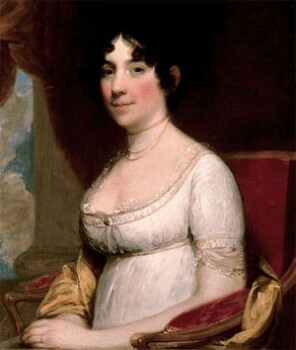 Dolley Madison (née Payne) was born in North Carolina in 1768 to plantation owners who had moved south from Virginia. She first married in 1790 to a Philadelphia lawyer, John Todd, with whom she would have her first and only children. The younger child (William Todd) and husband, however, both died in the 1793 Yellow Fever epidemic in Philadelphia, which would also heavily influence the United States Mint in the same city, as it had to cease operations for several months. She and her oldest son, John Todd both survived, and Dolley would remarry the next year with James Madison, a politician from Virginia and future president of the United States. James Madison was sixteen years Dolley’s senior and had been born on a plantation in Virgina. He studied in New Jersey (at what would later become Princeton University) and would become a young politician, in fact the youngest delegate in the Continental Congress in the early 1780s. Author of many of the Federalist Papers, Madison was well regarded in his lifetime, often named the “Father of the Constitution”, having had a rather large influence on one of the most important American documents still in use in (mostly) its original form. James Madison and now widow Todd were introduced to each other by Aaron Burr in 1794, most likely after Madison had seen Dolley walking around the capital. They would marry soon, in September of 1794, giving Dolley much needed financial security, a protector and social position in the important societies of Philadelphia. Dolley was well regarded both during and after her lifetime, and it would be fitting that she would be the first wife of a United States President to appear on United States coinage, on which she would be named as well. Originally the commemorative was to honor her husband, but it was considered to be more fitting to commemorate his wife, as he himself had already appeared on a number of different coins. Part of the proceeds would go to the National Trust of Historic Preservation, who had made the suggestion that the design for the coin would be made by a private company, Tiffany & Co. Somewhat surprisingly the Mint would approve, and would even allow the companies’ initials to appear on both sides of the coin. The result was stunning, and the Dolley Madison Silver Dollar would become one of the most beautiful modern commemorative designs. Tiffany & Co. is an upper-level jewelry maker that finds its roots in New York City, having been incorporated in 1837. The company initially focused on a wide variety of items, eventually specializing in jewelry as early as the 1850s. The company has had a close relationship with the United States government, having made such items as Union swords during the American Civil War, a revised Medal of Honor and a china porcelain set produced specifically for the White House by request from First Lady Lady Bird Johnson. It is unknown who exactly is responsible for the designs, and it would appear most likely that the designs are a collaboration of different employees of Tiffany & Co. Mint employees T. James Ferrell and Thomas D. Rogers Sr. are credited with making the models for the obverse and reverse, respectively. Their names do not appear on the coins, although the initials of Tiffany & Co. can be seen on both sides, as T & Co. Somewhat surprisingly this did not lead to any criticism from the collecting public, although the Dolley Madison Silver Dollar remains unique as the only coin designed by a for profit company. It resulted in a relatively popular modern commemorative, selling 89,104 uncirculated coins and 224,403 Proof coins, both minted at the Philadelphia Mint. Tiffany has some ties with the numismatic hobby. It was responsible for the 1885 redesign of the Great Seal of the United States, which appears on the back of every US dollar bill. Also, Tiffany Favrile Glass can be seen in seven pictorial mosaics at the Philadelphia Mint. Tiffany & Co. had requested that their hallmark “T & Co.” be placed on the Dolly Madison commemorative, and at first had wanted a more prominent display of their hallmark. The US Mint agreed that since the company was the source of the design, that it was proper that their hallmark be on the coin, but the Mint was not comfortable with the size of the hallmark. It was finally decided that the hallmark was to be no larger than the traditional size of the Mint’s artist-engravers’ initials. Dolley is also worth mentioning for her heroism during the War of 1812. When the British conquered southeastern Maryland she shipped out Washington’s portrait and all the government papers possible, evacuating the capital one jump ahead of the invaders. Without her calm and forceful action nothing would have been saved when the White House was burned.